Of all the problems a gas furnace can develop, a cracked heat exchanger is the most serious. Even with no moving parts, the constant heating and cooling that takes place puts repeated stress on the metal. After long service or if a defect exists in the metal, those stresses can result in small cracks developing. When that happens, it’s a serious issue that requires immediate replacement. The seriousness of the problem is due to the carbon monoxide poisoning danger that it poses to you and your family. As your trusted heating contractor in Minneapolis and St. Paul, we believe that it’s important for Minnesota homeowners to understand how their heating equipment works. What Is a Heat Exchanger? – Your furnace burns natural gas or propane in a combustion chamber. The heat produced flows around the heat exchanger. In high-efficiency condensing furnaces, there are two heat exchangers. Their primary job is to extract as much of the heat as possible from the burning gas and transfer it to the air circulating in your air ducts. Its other important job is to keep the combustion area and the air that circulates in your home separate. That’s because all combustion generates toxic carbon monoxide gas. Colorless and odorless, that gas normally goes out the exhaust flue to mix harmlessly with air outside of your home. Cracks in Heat Exchangers Allow Carbon Monoxide into Your Home – A crack can cause combustion gases to leak into the warm air circulating through your home. That poses a risk to you, your family, and anyone else in the home. That risk is why carbon monoxide detectors should be installed in every home. Carbon monoxide poisoning is more common than most people realize, and no home should be without proper carbon monoxide detectors installed according to building code requirements. Annual Inspection – The heat exchanger is located inside of your furnace and is quite large. Proper inspection is not simple, but modern inspection equipment allows visual inspection in most cases without extensive disassembly of the furnace. Thorough testing of heated air in any building can also be done with sensitive carbon monoxide detectors. Fortunately, cracked heat exchangers are far less common in recently manufactured gas furnaces, due to improved designs and materials. The thoroughly trained technicians with our Twin Cities heating and air conditioning company have the equipment and training required to perform this essential inspection. These inspections and tests are part of our annual tune-up process, as well as our furnace certification service. Beware of Scams – Due to the risks involved when a heat exchanger develops cracks, any furnace that has this problem must be red-tagged and taken out of service. 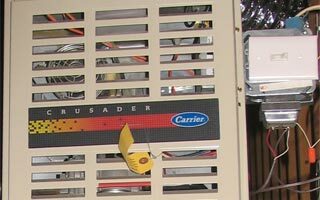 Unfortunately, in every area there are some unscrupulous people who will falsely claim that your furnace has a cracked heat exchanger and insist that you need a replacement. This scam often costs homeowners a lot of money. No reputable heating contractor will mislead you to sell you a new installation. The best way to prevent being duped is to rely on a trusted, established HVAC contractor with a solid reputation for all furnace maintenance and repair services. What to Do with a Cracked Heat Exchanger – If your furnace was recently installed, this defect may be covered by the warranty. If so, replacing it is the best plan, even though it may require major disassembly work. For furnaces over 10 years old, a heat exchanger replacement is costly enough that purchasing a new furnace is usually a better option. For old or obsolete furnaces, replacement parts probably may not even be available and replacing the system is needed. If a technician from our trusted HVAC company discovers a cracked heat exchanger during an inspection, we’ll discuss all of your options with you so you can make the best decision yourself. If you decide to replace the furnace, we can supply and install your choice of furnaces quickly, usually within 24 hours. If you decide to replace the heat exchanger, our repair technicians can perform the repairs as efficiently and affordably as possible. The choice is always yours, and we’ll give you all the information you need. Our award-winning service is only a phone call away, no matter where you live in the Twin Cities. Our service area includes all suburb cities, from Maple Grove, Eden Prairie, Minnetonka and Plymouth to Lakeville, St. Louis Park, Hopkins and Inver Grove Heights, and from Wayzata, Edina, Brooklyn Park and Champlin to Chaska, Woodbury, Hugo and Lake Elmo. Integrity and trust are the unwavering standards of our Minnesota locally owned and operated heating company. Our solid reputation for honest service and customer satisfaction is as important to us as it is to our over 35,000 satisfied customers. Since our founding in 1991, Twin Cities homeowners have put their trust in us for all of their HVAC needs. We encourage you to contact us to discuss your heating and cooling system needs. We’d welcome an opportunity to show you why we’re the Twin Cities best choice in service.